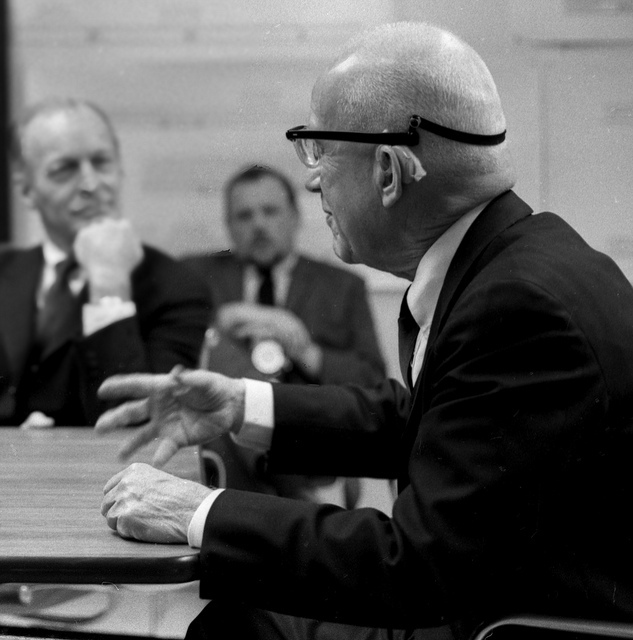 While working for Westinghouse in 1968, Chris Lozos, a well known graphic designer from Pennsylvania, USA, was lucky enough to meet and photograph R Buckminster Fuller at a meeting in the conference room. Chris has graciously honored us by sharing his wonderful unpublished photos; in which we, the reader, can see and feel the power of Bucky’s words and mind. One of the pictures Chris Lozos took of Bucky Fuller in 1968 in Pittsburgh merged with a shot of the Montreal Biosphere. The type is one of Chris’s soon-to-be-released called DezSpresso. “For the first time in history it is now possible to take care of everybody at a higher standard of living than any have ever known. Only ten years ago the ‘more with less’ technology reached the point where this could be done. 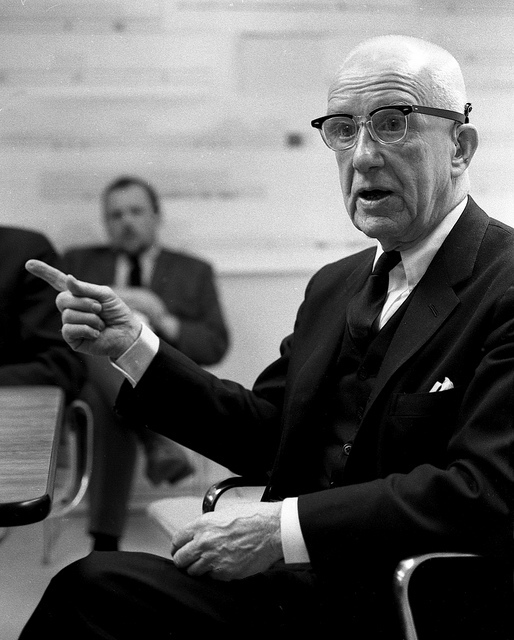 All humanity now has the option of becoming enduringly successful.” – Buckminster Fuller, 1980. 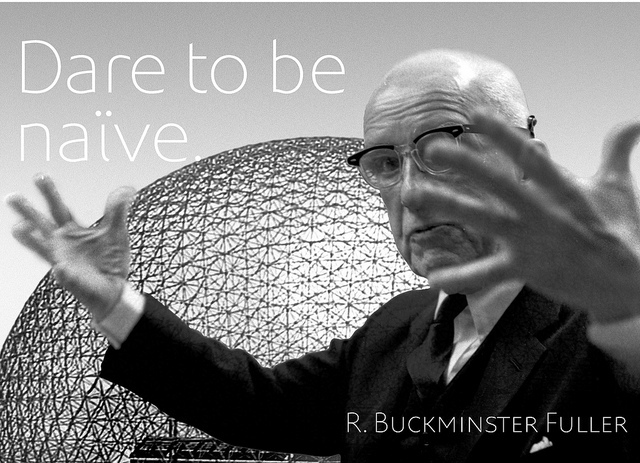 R. Buckminster Fuller (1895-1983), known as “Bucky,” was born in Milton, Massachusetts, USA, on July 12, 1895. During his lifetime he was known as one of the greatest minds in our modern age due to his vision and being part of many innovations; which would change the world. He dedicated his life in making the world better and for working for all humanity by not limiting himself to only one field of interest but looked at different ways to serve others and make a difference in their lives. Among his many accomplishments he was an author (having written 28 books), an engineer, systems theorist, a designer, inventor, (he called his inventions “artifacts” and held 28 patents) a thinker, visionary, mathematician, cosmologist, futurist and probably one of the first futurists who coined the term “Spaceship Earth” and in his lifetime he received 47 honorary degrees. 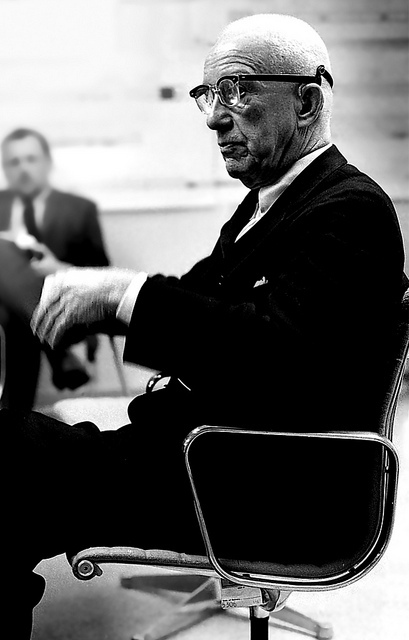 With his vision he was a ‘comprehensive anticipatory design scientist,’ which is the concept of attempting to anticipate the needs of others and to provide more life support for everyone while using less resources; which is where his philosophy of “more for less” came from. He would do his best to solve global problems surrounding housing, shelter, transportation, education, energy, ecological destruction, and poverty. Among his artifacts was the geodesic dome; which has been produced over 300,000 times worldwide. It used his principle “doing more with less” when he discovered that if a spherical structure was created from triangles, it would have unparalleled strength and could stand against earthquakes, tornadoes or hurricanes as well as having unparalled energy saving features. Other artifacts that may not be widely known were his Dymaxion House, Dymaxion Map, Dymaxion Car (which was designed in the early 1930s. This car featured very highly innovative, and ultimately influential features compared with the cars of the day. Among the features included were: a three wheel design with rear wheel steering and front wheel drive, a longer body (20 feet), and was a highly aerodynamic design. The car could transport up to 11 passengers and, upon testing, could reach speeds of up to 90 miles per hour. It also ran 30 miles per gallon), as well as his “great logistics game” and “world peace game” which would later be combined and called the “World Game,” which would address the problems of the world and the best way to solve them. He also introduced and formulated a system of holistic thinking which he called Synergetics. Synergetics endeavors to identify and understand the methods that Nature actually uses in coordinating our Universe (both physically and metaphysically) by using geometric modeling and explores inter-relationships in the facts of experience and the process of thinking. It provides a method, as well as a philosophy, for problem-solving and design. It has, therefore, an application in all areas of human endeavors. 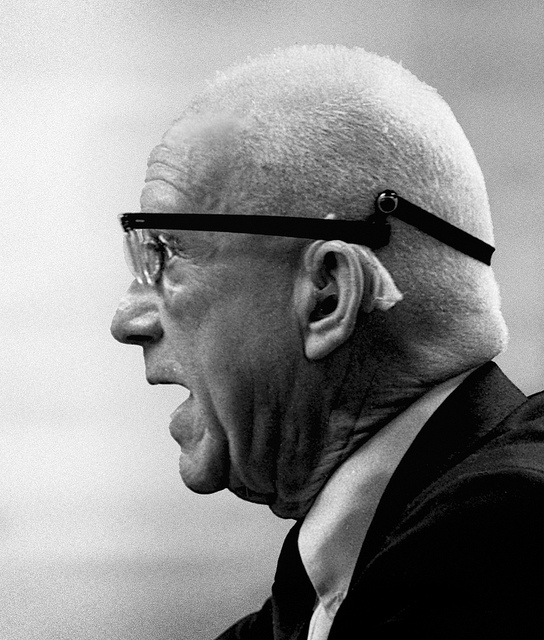 Bucky’s impact is still felt today, through his institute: The Buckminster Fuller Institute and The Buckminster Fuller Challenge, which is an annual, global competition and has been named “Socially-Responsible Design’s Highest Award” by Metropolis Magazine. This competiton recognizes the importance in designing science’s approach in order to radically advance the well being and health of humans as well as our planet’s eco-system. The true impact of Bucky in the world, however, is not just on his artifacts but on his continued influence upon generations of designers, architects, scientists and artists working to create a more sustainable planet. That, and being the caring human being he was, is his true legacy and one Chris Lozos experienced in 1968 when he met Bucky Fuller in person . . . .
Chris Lozos, a.k.a Dezcom, has been either studying, teaching, practicing, or managing graphic design since 1960. After decades of graphic design, he retired from his “day job” and began anew as a typeface designer. One of his type families will be featured in the inaugural Creative Review Type Annual to be released in January 2011. His work also appears in “Type Image” by Barbara Brownie; “Typeface: Classic Typography for Contemporary Design” by Tamye Riggs; and “Graphic Design Processes” by Ken Hiebert. Chris has been a frequent poster on “Typophile.com” since 2004 and a regular at TypeCon conferences across the country. Chris Lozos began life as a lover of letters. He studied Design at Carnegie Mellon University where he earned a BFA in Graphic Design (1966). While at CMU, he studied with calligraphers Arnold Bank and Howard Glasser, who both brought out the love of historic letter-forms and learned to set hot metal type in the Laboratory Press established there by Jack Stauffacher. Chris also was influenced by guest professors Hermann Zapf, Rudy DeHarek, Martin Krampen and Gui Bonnsieppe (of the HfG Ulm). He attended Graduate School in Visual Communication Design at the Ohio State University from 1972 through 1974. In 1989, he was a participant at the CMU Graphic Design Summer Program, taught by Wolfgang Weingart, Ken Hiebert, and Dan Boyarski.